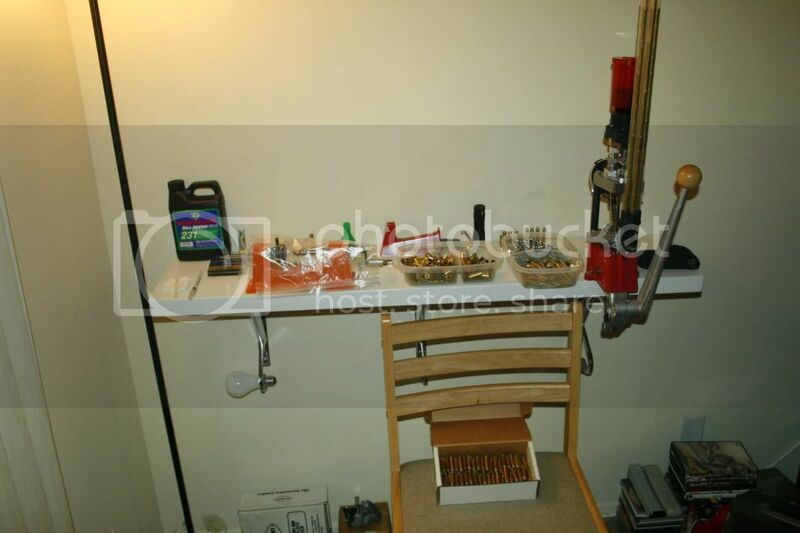 Posted: Tue Mar 03, 2009 8:41 am Post subject: Re: Where is your reloading room/equipment ???? Father Eric aint said I did nuttin' wrong! Posted: Thu Apr 23, 2009 7:48 am Post subject: Re: Where is your reloading room/equipment ???? Posted: Thu Apr 23, 2009 9:42 am Post subject: Re: Where is your reloading room/equipment ???? My shared bedroom looks like a military barracks with the guns,bayonets and various relics sitting around. Posted: Thu Apr 23, 2009 11:01 am Post subject: Re: Where is your reloading room/equipment ???? Each one of my guns has a pet load. So, for the most part, I just loadem up in the summer and fall so I dont have to freeze my arse off or wast $$ heating my shop in the winter. If a Buddy comes over and needs some ammo loaded in the winter, we just fire up the heater and loadem up. Because its insulated, it does not take long to warm up no matter how cold it gets. Posted: Thu Apr 23, 2009 8:47 pm Post subject: Re: Where is your reloading room/equipment ???? Welcome aboard "The Nut" Idaho_Elk_Huntr. Grab a beer, pull up a stump and sit a while mate. Posted: Tue May 12, 2009 6:07 pm Post subject: Re: Where is your reloading room/equipment ???? All my goodies are set up in the living room! So far my wife hasn't said anything about it. I try to keep it tidy so she doesn't decide to throw it and me out in the Minnesota cold. The kids will be leaving the nest soon so I imagine the topic of moving it into one of thier rooms will eventually come up. I'll have to come up with a good argument to leave things like they are. Posted: Wed May 13, 2009 8:22 am Post subject: Re: Where is your reloading room/equipment ???? Posted: Wed May 13, 2009 8:30 am Post subject: Re: Where is your reloading room/equipment ???? Posted: Mon Sep 21, 2009 12:15 pm Post subject: Re: Where is your reloading room/equipment ???? All my goodies are set up in the living room! Posted: Mon Sep 21, 2009 2:41 pm Post subject: Re: Where is your reloading room/equipment ???? I have to ask. And I know I'll probably regret it...But what is that light bulb under the bench for?? Posted: Mon Sep 21, 2009 5:10 pm Post subject: Re: Where is your reloading room/equipment ???? 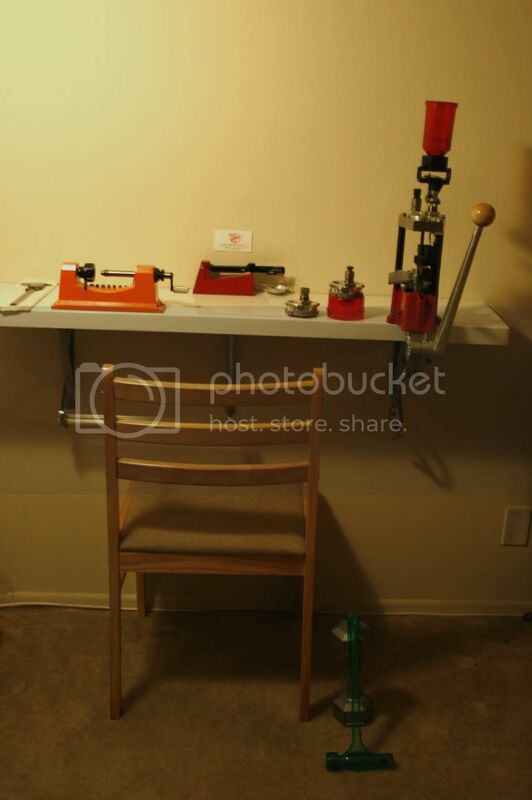 In case he gets an idea, Mine is in a 8x16 shed out back where I do most of my stockwork, the reloading press is bolted to a 2x8 oak board bolted to the top of an old army desk complete with folding typewriter shelf. Posted: Mon Sep 21, 2009 5:13 pm Post subject: Re: Where is your reloading room/equipment ???? I thought it might come on when his stomach growled to remind him it's time to eat!!! Posted: Tue Sep 22, 2009 6:26 am Post subject: Re: Where is your reloading room/equipment ???? Yer all right!.... to an extent. That bulb is the 60w bulb. There it sits while I doddle at the bench w/ another 150w 3-way in the lamp that normally resides there. Those brackets are nomally used to hold up clothes and those hook are the dowel rod holders for hangers. The bulb and bullet puller snap right into those little grey hooky thingy's. Them brackets are pretty bomb proof too. That whole bench cost me almost nil. Posted: Tue Sep 22, 2009 6:32 am Post subject: Re: Where is your reloading room/equipment ???? Posted: Tue Sep 22, 2009 7:24 am Post subject: Re: Where is your reloading room/equipment ???? Oh comon now...it's a "one-cup'er". I use the 150w for loading and the 60w for relaxing in the living room. Them little hooks are the perfect size for holding the bulb and keep's them handy right next to the lamp (the long black thing next to the powder).